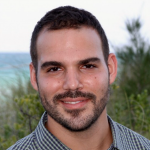 Michael A. Antinelli, PE, CFM is a Co-Founder of Brizaga and a licensed Professional Engineer in the State of Florida with previous experience in the practices of coastal, waterfront, and site civil engineering. As a Certified Floodplain Manager, he couples his technical knowledge of coastal dynamics with the regulatory standards implemented by local, state, and federal agencies to provide municipalities and private citizens with the most comprehensive set of guidelines and direction for adaptation planning for flood related incidents and disasters, including sea level rise and storm surge. Prior to founding Brizaga, he worked as a project engineer for a large infrastructure engineering company in New York City where he focused on coastal resiliency and recovery efforts in response to Hurricane Sandy. He also served as a project engineer and project manager for a civil and coastal engineering company based in Coral Gables, Florida where he developed and managed projects and budgets at every level, from the project planning and conceptual design stages through design development, construction, and project closeout. His technical expertise encompasses beach nourishment, bulkheads and seawalls, breakwaters and revetments, marinas, site civil engineering and drainage systems, FEMA coastal zone modeling and mapping, environmental permitting, and computer applications in flood modeling and asset management. Michael founded Brizaga with a vision to unify the cities and communities leading the adaptation and resilience efforts, to provide policy makers with the tools needed to make the most informed decisions, and to help private citizens overcome the challenges they will face on their journeys to a better, more resilient tomorrow.